As much as I love the ankle booties I purchased especially for my London vacation, I have a confession to make! One I did not want to admit earlier especially to B because I knew he'd give me his "I told you so" look. So I silently endured the first few days of our vacation wearing my bootie heels. I braved through the pain and discomfort because I love the way my heels looked on me. But as awesome as they were, I hereby sadly admit that my lovely booties were just not comfortable enough to withstand the endless walking we did while vacationing. Usually, I'd bring two pairs of shoes including a pair of sneakers while on vacation. This recent one however, I was quite strict with my packing and left my sneakers behind; refusing to add additional weight to my luggage. Truth was, I was planning a shopping spree and needed all the space I could get to stuff in my buys later! 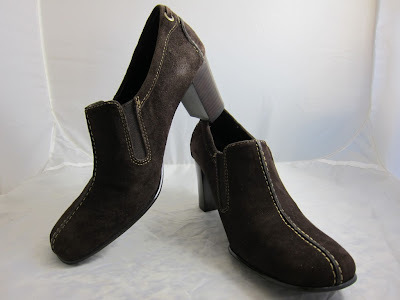 Gorgeous ankle booties from Liz Claiborne! To be fair to my lovely ankle booties, I did enjoy wearing and walking around in them for the first three days. Day 4 saw the pain starting to kick in and by the end of Day 5; I returned to our hotel with a pair of Footglove shoes from Marks & Spencer! I finally surrendered to the call of a new pair of comfy flat shoes since there was still plenty of walking, shopping and sight-seeing remaining on our agenda. Anyway, they're off-white and the last pair available was in my size 7; kind of meant to be I guess! And yes, I did appreciate the immediate immense difference it made to my feet and I do admit that I walked a lot faster and easier with my new comfy women's flats. So you win Love and I do deserve that "I told you so". Worry no more however for I will DEFINITELY go back to practising my two-pairs-shoes-including-sneakers rule on our next getaway! When will that be? ;) ;) ;) ;) Nessa FC2! Hahaha ... all in the name of ego! LJ FC3 indeed, thanks sweetie.. I really berkenan this LC one dearie, hope u find a nice pair soon cause u naik bike so mmg appropriate to get one, kat Sing hari tu tak jumpa eh? that's why lah.. so nice this one.. how much? lol! Ha ha ha ha I think less than $50 this one LJ, murah tu!! Shopwiki… :) LJ still searching for her boots, hope u find one soon! :* :* :* Hey Part! lol.. i hope so too!!! oh how is B's sakit gigi.. dah gi dentist? Just mandi! Ha ha craziness! Hmmm B dah seminggu dah sakit gusi tu… so one side of his face is swollen.. I’ve been cooking porridge for him cause that’s all he can eat… yeah went to see Doc and Dentist edi… hopefully will go away soon.. :) Thanks LJ! Cian B.. hope he recovers soon ya..
those booties are incredibly gorgeous and you've a good eye for style Marzie. but when i travel, i don't think i can wear those high heel booties. Traveling can be rough, especially on the feet if you're walking endlessly with those heels. When I must spend much of a trip walking all day long,my best best is still flat sensible shoes. I usually travel light and pack the minimum. Those shoes are fab, but they're a killer if I walk on them on a sightseeing tour. I'm the kind of gal who loves comfort so I can enjoy my tour. Haha!! U want to be like Mariah Carey ah? Only wear high heels and zero flats! LOL!! Walking so much during vacation how to tahan even though u r not FBB like Mariah? Haha!! You go shopping must walk fast fast sure must wear flats lah, how long u can take it with high heels? LOL! Ayie, Mariah Carey dance on stage while prego also wore high heels!! Haha! Dat;s why she fell! LOL!! What to do Foong, me stubborn muahahaha! Lol if I’m prego surely I won be wearing heels la and I def won’t be dancing on stage hahahahahha! He he he, in the end I had to succumb to flat shoes Bing Kee, but this still won’t stop me from trying to find the perfect heels that are comfy for long distance walk on tours muahahaha!